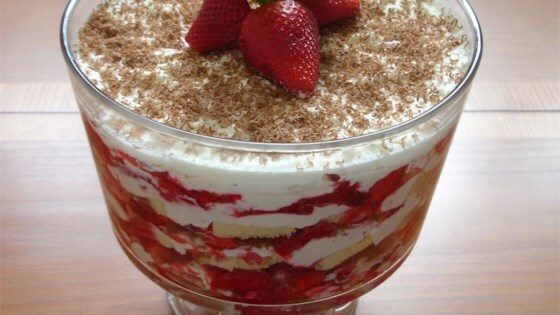 "Layered dessert that should, in theory, feed a lot of people! I know it's not a typical cake, but I think it's better than that! And it really does feed a lot of people!" I made this recipe and added layers of shaved chocolate. I didn't use the cocoa as I was out. It was very good! Will definitely do again. This is a very good and easy recipe. We have tons of raspberries growing in our back yard every year, and this gave me a new and tasty way of using them. This was excellent. I used angel food cake and added raspberry liquer and frozen blackberries with the frozen raspberries! Big hit!